Late in 2011, I made a conscious decision to try to attempt to eat locally. Avoid chains restaurants as much as humanly possible and instead eat at locally established restaurants. I’ve added local chocolate artisans to that list. Since when did I become that person? During the saw the economic downturn, I saw that friends and family were affected — many who owned and or ran a small business. So I decided to try to purchase as many things as possible from small businesses while helping the economy. There was an added bonus if it was local. Thankfully my sweet tooth can also help. 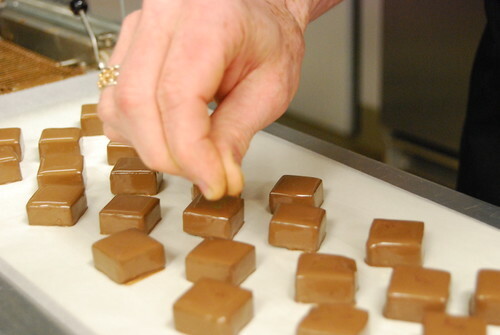 While David Bacco is not a San Diego native, he relocated to Southern California in 2010 to continue creating chocolates that he initially started in 2008 in Madison, Wisconsin under David Bacco Chocolats. Now as David Bacco Chocolatier, he’s introduced San Diego to his more of his handcrafted chocolates. Yes, each one is individually handcrafted by a company run by only two people. One thing to note is that his all of the chocolates — from the aromatic Ceylon to exotic Rio — is well thought out. Many of them have as Asian-inspired flavored with some having hints of lemon grass, mango, Chai, lime, jasmine and cardamon. 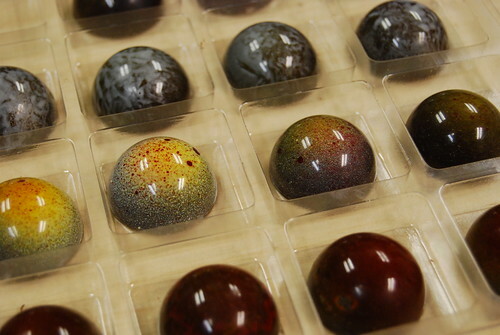 Last fall, David created chocolates inspired by local craft beer. It’s not just a one-note chocolate and many of the individual pieces resemble glistening, delicious gemstones that can be consumed. All his creations has depth that should be thoughtfully consumed much like wine. Notice any the glossiness and sheen of the chocolate. Smell the chocolate. Are there any lingering aromas? Don’t just chomp. Allow chocolate to melt in your mouth allowing the flavors to slowly reveal themselves. With all complexity his chocolate, it’s so much easier to enjoy. 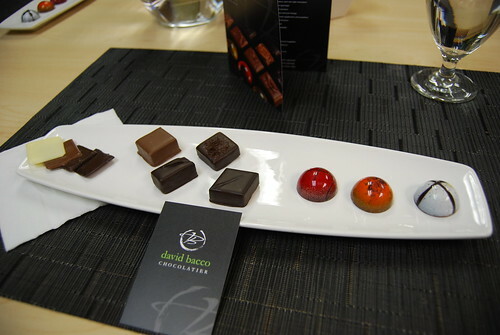 David Bacco Chocolatier can be purchased online as a customized four, nine or 18-piece selection and single origin bars. They can also be found at Seaside Market in Cardiff by the Sea, Harvest Ranch Grocery stores, Jonathan’s in La Jolla and coming soon, Albertson’s in Del Mar. Now for the giveaway. Leave a comment on your favorite way to eat chocolate and I’ll randomly chose one person to receive a 9-piece box of chocolates to receive just in time for Valentine’s Day courtesy of me! Giveaway ends February 8 and is only open to U.S. residents. Good luck! Congratulations to lucky number 2 — Lorena! The winner was chosen using Random.org selecting one person out of 24 responses. I wish I could give everyone a box of chocolates because all the responses were hilarious. Please email me your address Lorena and I’ll send out the chocolates to you ASAP. Another giveaway? Wow, Darlene, thanks! Love that you’re eating more local. We’ve been trying to do the same. Thankfully, San Diego is full of so many good family-owned restaurants! As far as eating chocolate goes, I love savoring it with a cup of really good coffee – the bitterness always seems to complement the sweetness of the chocolate. I love eating chocolate in smores! My favorite way to eat chocolate is alongside a glass of champagne or red wine. I will need to look for these at Seaside! Oo, local chocolates! I try to eat local as much as possible, too. There’s so much to try! My favorite way to eat chocolate is simply by itself. A little bit of chocolate can instantly put a smile on my face. Thanks for the giveaway! I love eating chocolate in secret, preferably out in the garage. I have to with impressionable twin two year olds running around claiming everything they see they “I want” or “is mine!” Plus, I never thought I’d say this but eating chocolate is exciting! Dangerous! Makes it so much more pleasurable, um I mean delicious! My favorite way to eat chocolate is with reckless abandon and complete disregard for moderation. Great story, love that the company is so hands-on and that he was inspired by craft beer. My favorite way to eat chocolate is definitely in extra rich, tiny packages, like fudge and truffles. Small bites, lots of crazy happy noises. With my husband. He does the best crazy happy noises. 🙂 These look insane! i love taking a piece of regular chocolate and then dipping it into the peanut butter jar. I enjoy eating my chocolate with a side of chocolate. On the couch, in my Snuggie, watching trashy tv shows on the dvr. I don’t have much of sweet tooth so the candy aisle in the grocery store is no temptation for me, but when it comes to truffles and high end chocolates, I don’t have self-control….I gobble them up! Sometimes I remember to savor the last one or two. I like a nice, creamy, complex 70% chocolate to slowly melt in my mouth. I like milk chocolate out of hand, preferably Dove brand, and bittersweet chocolate in cakes, ganaches, hot fudge sauce, etc. I’m a “chocolate purist”! Good chocolate all by itself melting slowly on my tongue and savoring it! Yum!!! I love enjoying a delicious piece of chocolate (my favs are dark or anything with peanut butter included) with a delicious cup of tea. Very nice dessert. I like to freeze my chocolate and then let it melt in my mouth. Something about the cold/warm thing! i like eating chocolate after having put it in the fridge. i like it eating it by itself (and by myself, ha ha), so no drinks. I will eat chocolate just about any way, any place, any time. I love chocolate. These are beautiful pieces of art. I can only eat a small amount at a time, If I eat a whole candy bar that contains chocolate I get a headache within minutes. I don’t let that stop me I eat a single bite at a time. I have found that while running marathons I can eat chocolate along the way with no after effects. My favorite way of eating chocolate is by itself until I can’t eat anymore. At least for that one sitting! I can eat chocolate any way and love it.